The status of the red wolf – that reddish-brown canid of the American Southeast that's about midway in size and habits between a coyote and a grey wolf – has been in flux for decades, and these days it's up in the air on a number of counts. The United States Fish and Wildlife Service (USFWS) is reconsidering its strategy for recovering the animal, among the rarest of the world's wild dogs, and meanwhile taxonomists continue to debate its position on the Canis family tree. In light of all that political and scientific murkiness, it's a pleasure to watch red wolves just doing their thing in the wild. Camera traps maintained by the Wildlands Network conservation group have collected some great video in the heart of the wolf's precarious stronghold on northeastern North Carolina's Albemarle-Pamlico Peninsula. Footage courtesy of the Wildlands Network. Ron Sutherland of the Wildlands Network told us all four clips here were taken in the Alligator River National Wildlife Refuge, part of the 1.7-million-acre, five-county red-wolf recovery area that also encompasses Pocosin Lakes National Wildlife Refuge and other federally managed holdings, state-owned lands, a government bombing range and private acreage. Sutherland said the first video showed young wolves or possibly wolf-coyote hybrids, while the other three clips are most likely of the longstanding Milltail Pack. The red wolf (Wa'ya to the Cherokee) once trotted over most of the American Southeast; where and how the boundaries of its range edged that of the grey wolf is one of many, well, grey areas of canid natural history in pre-Columbian North America. Weighing some 23 to 36 kilograms (50 to 80 lbs), red wolves were historically not only the grizzled chestnut colour that gives them their common name but also frequently black; early naturalists, for example, recognised a "Florida black wolf". Wade into the taxonomy of the red wolf – and of the genus Canis in North America, for that matter – at your own risk. It's a fascinating but thorny topic that's far from settled, and loosely speaking involves about five canines: the Eurasian-evolved grey wolf (which may have colonised North America in multiple waves) and the New World-derived red wolf, Algonquin (aka eastern or Great Lakes) wolf, coyote, and the so-called "eastern coyote" (frequently referred to as a "coywolf", though mammalogist Roland Kays takes some issue with that). The species status of the grey wolf and coyote are firmly established; where the others fall in the Canis lineage is less settled, to say the least. A 2012 review concluded the red wolf, Algonquin wolf and coyote are likely relatives with a common ancestor; a 2016 genetic analysis, in turn, proposed red and Algonquin wolves derive from varying degrees of quite recent grey wolf/coyote hybridisation. Yet another assessment from last year, which scrutinised ancient canid remains from the American Southeast, suggested the red wolf may (a) have evolved from prehistoric coyote-wolf interbreeding, or (b) share a forerunner with the coyote. As the authors of the 2016 study suggesting either long-ago hybridisation or unique lineage for the red wolf noted, "If red wolves have an ancient hybrid origin, it would not preclude the species from protection, and furthermore, it emphasises the dynamic nature of canid evolution." Genetic fingerprinting of the red-wolf line is complicated because of the very small founder pool. By the early 1800s, the lithe deer-, raccoon- and rabbit-hunting wolves of southeastern forests and swamps were already vanishing. By the mid-20th century they were mainly restricted to the Gulf Coast of southeastern Texas and southwestern Louisiana (earlier strongholds apparently included South Florida's Big Cypress and the Okefenokee Swamp on the Louisiana-Florida line). The USFWS declared the red wolf endangered in 1967 and launched a recovery programme in 1973. Subsequently – with the future of the species in the wild deemed unlikely given habitat loss and interbreeding with coyotes – more than 400 wolf-like Gulf Coast canids were rounded up to initiate captive breeding. Only 14 of those several wild dogs were ultimately determined to be genetically "pure" red wolves, and the dozen of those that reproduced in captivity became the founders of today's population. 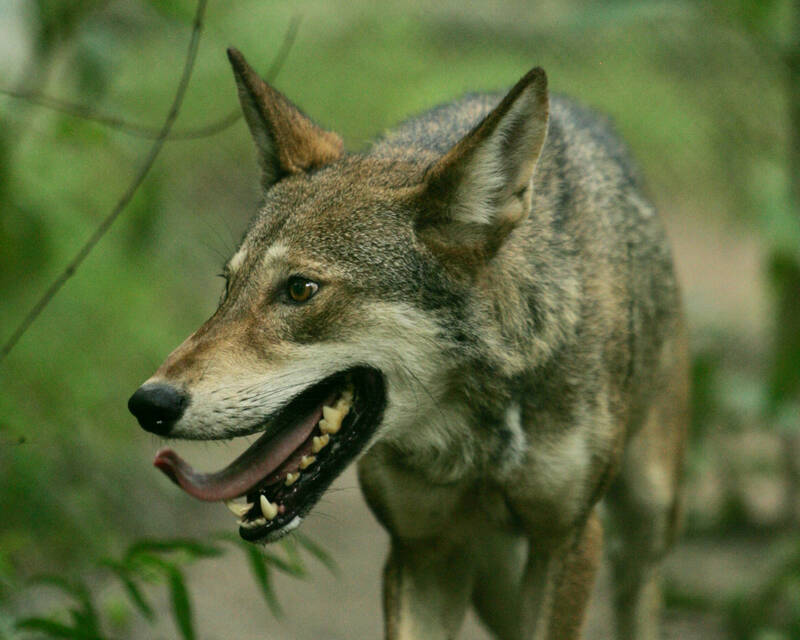 In 1987, red wolves were reintroduced to the Alligator River National Wildlife Refuge: the first attempt anywhere to reintroduce a large carnivore to its former range. The following spring, biologists documented the first wild-born red-wolf pups in North Carolina since the animal's extirpation. Coastal North Carolina (as well as several southeastern islands where wolves are acclimated for release) has remained the outpost for wild red wolves in modern times; a 1990s reintroduction attempt in Great Smoky Mountains National Park in the Southern Appalachians was abandoned after wolves dispersed outside park boundaries. Last year, the USFWS announced a shift in its red-wolf strategy: restricting recovery efforts in the wild to publicly owned acreage in a single North Carolina county while attempting to double the captive population to 400. A number of conservation groups decried the announcement, and in September 2016, a judge barred the agency from removing red wolves that aren't directly threatening pets or livestock from private lands. Earlier this year, the USFWS solicited public feedback on the changes it was proposing. An analysis of the 55,000-odd comments received, conducted by the Wildlands Network and several other conservation organisations, suggested 99.8% supported efforts to restore wild red wolves in North Carolina. The conservation coalition noted in a press release from this August that this support extended to the local level. "Zooming in to northeastern North Carolina, more than two-thirds (68.4%) of the comments from the current five-county recovery region were supportive of the Red Wolf Recovery Program, undermining claims that local residents oppose red wolf restoration," they wrote. You can read more about the USFWS's approach to red-wolf recovery here. The presence of red wolves makes the Alligator River and Pocosin Lakes refuges especially impressive expressions of North Carolina's wild heart. To fully appreciate it, be sure to browse the camera-trap galleries of the Wildland Network's Flickr page: a rich cast of other characters from the Albemarle-Pamlico backcountry – including white-tailed deer, bobcats, and lots and lots of black bears – make cameos. Is this coyote-wolf hybrid taking over North America? When coyotes hunt, they usually stick to smaller prey – but one lone ranger in Maine decided to go for the gusto when it attacked a passing deer.